Our Mechanical Bull was designed, engineered and built by professionals from top to bottom with the customer's interest in mind using High-quality parts, precision fabrication, ease of use, protection of your investment during transit and more. This Mechanical Bull is built for performance, longevity and to make you shine in front of your customers. Once you buy a Mechanical Bull it's easy to turn it into multiple games like mechanical snowboards, surfboard simulators, mechanical sharks and more by just adding attachments and banners. 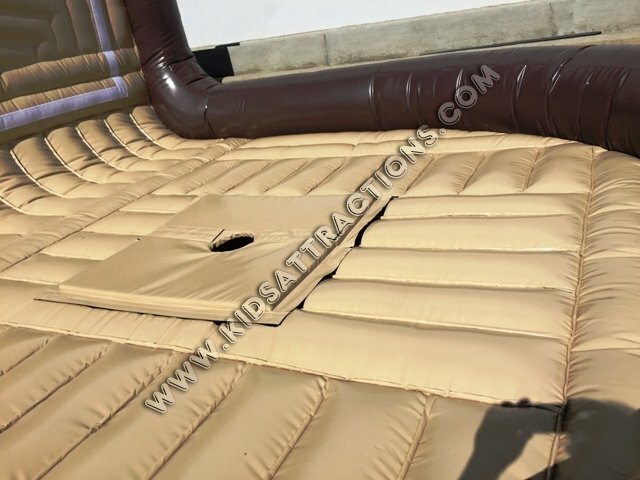 If you own or operate a Party or Event Rental Company, Family Entertainment Center, Amusement Park or Summer Camp and looking for a great way to generate revenue and provide entertainment for kids and adults than our Mechanical Bull is it. 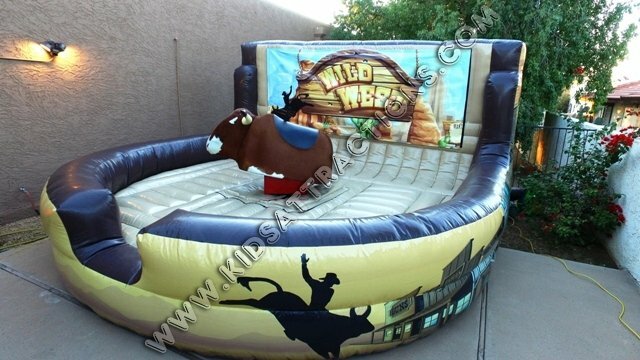 Our Mechanical Bull Ride will make you money either as a rental item or as a pay for play. The versatility is great because you can easily replace the inflatable back wall with custom banners or corporately branded artwork to keep you in front of the competition and please your customers. 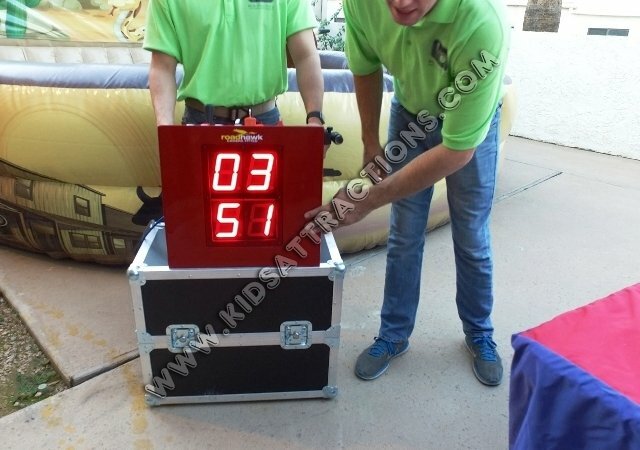 Whether you're new to the mechanical bull market or a seasoned operator you will love the GS Mechanical Bull made in the UK since 2003 and now available in from Kids Attractions in Scottsdale, Arizona. We stock the world-famous GS mechanical bulls that come loaded with so many features they leave ALL other mechanical bull manufacturers in the stone age. Easy to assemble, easy to operate and customers love the look and feel. Be sure to check out our Mechanical Bull Video. GS Engineering has been manufacturing mechanical bulls, surfboard simulators, and fiberglass attachments since 2003 and has perfected the mechanical bull ride. Some of the features include small compact operator console with road case, 3 automatic ride programs, 2 large LED timers, magnetic bullhorns, super strong support legs with rubber feet, soft cowhide covered bullhead, real cowhide bull body, leather saddle, Patented western themed bull mattress with removable banners, automatic shut off when riders let go of the handle, USB port on the operator console and more. Our Mechanical Bull starts and stops super fast with super low amp draw and will impress even seasoned mechanical bull operators. 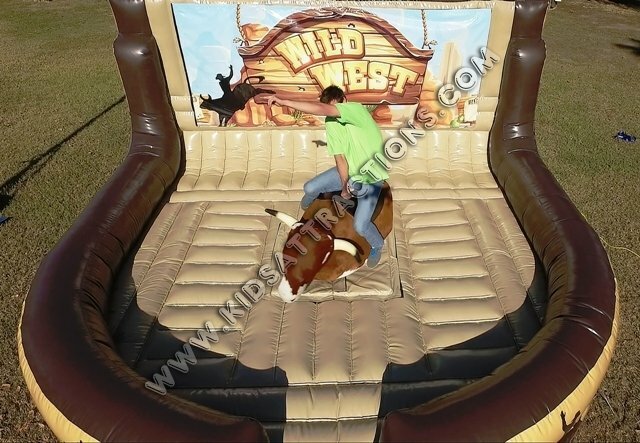 Our mechanical bull runs on 110-volt electric power and is super easy to set up and operate. Mechanical bulls are great money makers and once you have a mechanical bull it's very easy to make other attractions by just adding attachments like surfboards for surfboard simulators, mechanical reindeer, and snowboards for winter-themed parties. Don't let the stigma of mechanical bulls scare you from purchasing a mechanical bull for your indoor facility, theme park, rental company or resort. Our mechanical bulls are super high quality and will deliver years of worry free service and generate a great revenue for your business. 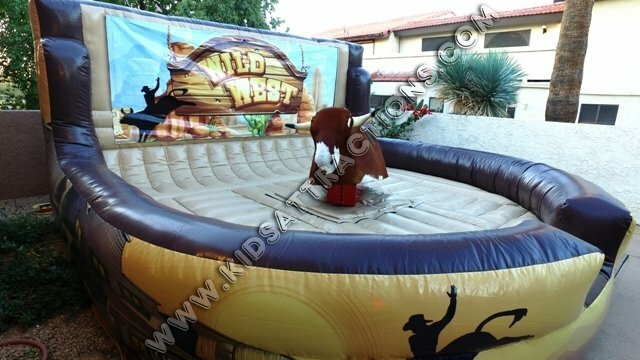 Our beautiful western themed inflatable comes with a western themed removable banner on the back wall so you can quickly theme your mechanical bull for clients or seasons in less than 1 minute, something never offered before and only found at Kids Attractions. Don't let the good price fool you. This mechanical bull is the Mercedes-Benz of mechanical bulls. Call, Click or come by today for more information about our mechanical bulls. We don't offer confusing mechanical bull packages or options just 1 super high-quality mechanical bull ready to make you money. If you're looking to purchase a mechanical bull some of the first things people ask are "can I get it insured"? The answer is yes if you purchase the right mechanical bull. I will explain some things to look for when considering the purchase of a mechanical bull for your party or event rental company, amusement park, indoor fun center or bar. The best mechanical bull on the market is made by GS Engineering in the UK and is perfect for rental companies, amusement parks, FEC or family entertainment centers, and bars. The GS Mechanical bulls are available in the US from Kids Attractions in Scottsdale Arizona along with 24-hour phone support, a full repair center, and spare parts for the GS mechanical bulls. All common parts are available to purchase online from Kids Attractions. Parts and support for mechanical bulls are huge and personally, I wouldn't buy a mechanical bull from anyone who didn't offer these two items regardless of the cost because what are you going to do when it doesn't work, or you lose or break something? Things happen and you will need service and support for any mechanical bull you consider buying so take my advice and buy a GS Mechanical bull from Kids Attractions. Insurability: When you tell your insurance company you are buying a GS Mechanical bull it's almost guaranteed to be on their approved list of mechanical bull rides. If not, just contact us and we will make sure to get it approved for you. Ease of setup and portability: GS Mechanical bulls are super compact and easy to transport and include a road case for the control console that houses all of the cords, springs, operator instructions and tools necessary to set up and dismantle the mechanical bull along with storage bags for the loose parts and more. User-Friendly: The GS Mechanical bulls are super easy to set up and operate. You can teach someone to operate the GS mechanical bull in about 15 minutes and it comes with 3 automatic settings from easy to almost impossible with one simple press of the button. The only tool necessary to set up a GS bull ride is one wrench, that's it. 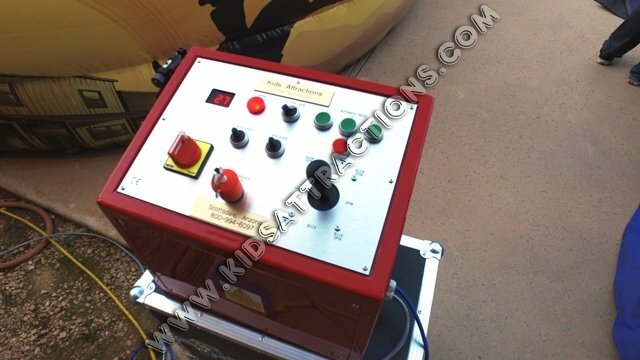 Customers love the big LED timers: The GS Mechanical bulls come with 3 LED timers on the control console making them perfect for bull riding competitions. The operator has a small LED timer for reference and 2 big LED timers on the front of the console facing the rider and or crowd. One of the timers is the current ride time and the other is the best overall time that can be easily reset any time by the operator. 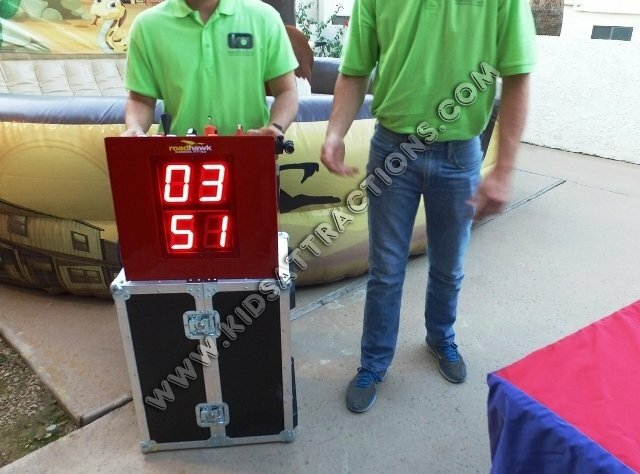 Both timers are stacked on top of each other making them very easy to read and will be sure to get the crowd roaring and trying to beat each other for the perfect bull riding competition. Inflatable Bull Matt: Our western themed mechanical bull mats are beautifully designed to make your mechanical bull stand out from the crowd with professional digital printing on the sides and a huge digitally printed backdrop that can be easily changed for many different looks. It can also be easily themed for corporate branding or custom theming by just ordering new banners that simply Velcro on, something never before offered on a mechanical bull inflatable. Bull Horns and Bull Body: Our mechanical bullhorns are made of foam and attached with magnets making them super easy to install, reattach and super safe for the riders. Our mechanical bull body is covered in real cowhide and features a cowhide-covered soft bullhead and leather saddle for the real bull look and feel. 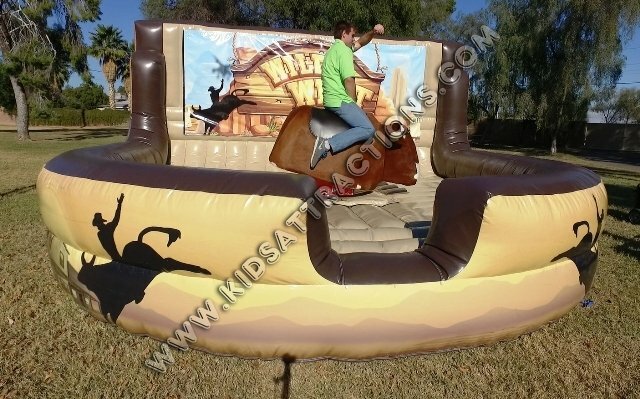 The soft bullhead is a requirement of almost every insurance company and comes standard on every GS mechanical bull sold by Kids Attractions. Does the Mechanical bull come with a road case for the controller? Is the Mechanical Bull in stock ready to ship? Do you add charges to pay with a credit or debit card? Do you charge for crating or packaging the Mechanical Bull? Do we need to ship the Mechanical bull back to you in order to get service work done? Do you offer 24-hour technical phone support? How many support legs does it have? Does it come with a storage bag for the legs? Do the support legs have rubber feet to prevent floor damage and movement during use? Does the Inflatable mattress come with digitally printed artwork and removable backdrop? Does your mechanical bull start and stop within a quarter turn? After you ask these few simple questions it will become obvious that the GS Mechanical bull sold by Kids Attractions is the one to buy and we work will many different finance companies to make your purchase possible. How fast does it stop? Do you offer removable artwork for the back wall? Can it be added to your mechanical bull? Does the electric motor stick out of the mechanical bull base to collect dirt, water, and rub on the inflatable? Are the cable connections recessed or do they stick out? Are the power wires and connection cord attached to the operator's console or separate parts? Will the Mechanical bull have problems working if plugged into a generator or GFI Outlet? Are the power cords and control wires connected or separate parts? Will the support legs require tools to install? This is just a few improvements featured on the GS Mechanical bulls over the competition and you get 24-hour phone support with every mechanical bull ride. These are serious questions to consider before making a mechanical bull purchase and we will be here to help you along the way. We also have a full parts department available online to order any part for the GS Mechanical bulls or any other products we manufacture for fast, easy repairs or to replace lost or damaged parts. Create an account with us online and ordering things from us is as easy as Amazon. I have 2 of these mechanical bulls and i love them. 3 years of use without any problems and i couldn't be happier. 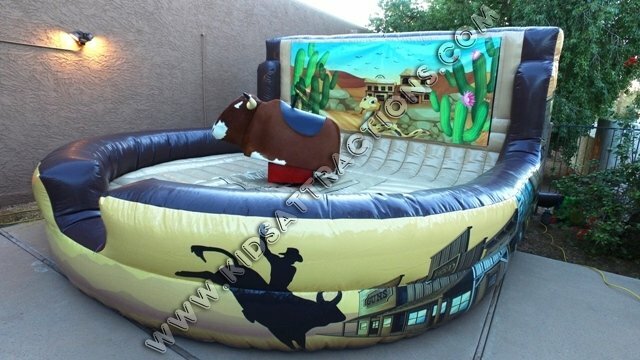 We own 3 of these mechanical bulls and would not own any other mechanical bull. Our customers love the big LED timers and our employees love the fast setup and ease of use. The overall quality of these mechanical bulls is the best i have ever seen and we attend lots of trade shows and have seen just about every mechanical bull on the market and would not buy anything else except the GS mechanical bulls for our party rental company.